I hope you all thoroughly enjoyed your Christmas yesterday! Today, it's time to check out my FAVORITE color of all: purple! And it should come as no surprise that I chose a top FOUR, rather than a top three! My favorite blurple was undoubtedly Cult Nails Flushed. With a fuchsia shimmer, it practically glows on the nail. Love. It! China Glaze Jungle Queen may not have been the most unique (as a dupe of Chanel Paradoxal), but I give them credit for a good formula and giving me an awesome $8 alternative to a Chanel! Kudos, CG! Maria, Maria! 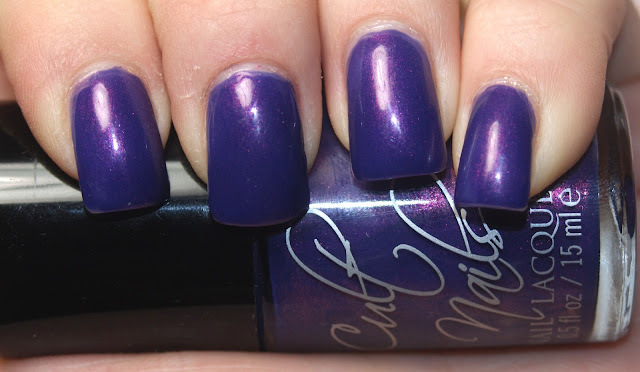 Maria of Cult Nails did it AGAIN with a gorgeous purple jelly flakie top coat in Seduction, pictured here with two coats over Cult Nails Iconic. I mean... look at that shift of color. There are just. No. Words. The ladies of The New Black win the award for purple uniqueness, with this awesome five piece mini set. An easy way to put a little ombre in your day, I fell for this one upon sight. And it looks pretty cute with my blueberry plant, too! If you could only have one purple from 2012... what would it be?